What if it turned out that newspaper articles about pharmaceutical products that could take or save a person’s life had been paid for? In fact, they have been for years. Our suspicions started to develop in March 2016. It all started when we happened upon documents showing that ¥550,000($1.00=¥110.00) traded hands over an article about blood thinners used to prevent stroke. According to the documents, the money was paid by a member company of Dentsu Group, a major advertising agency contracted by a pharmaceutical company. The money had gone to a subsidiary of Kyodo News, a news agency that provides articles for regional newspapers all over the country. Blood thinners prevent coagulation of the blood. They are very effective, but can cause cerebral bleeding in some patients. Although no causal relationship has been firmly established, administering practitioners have reported hundreds of deaths to public agencies. Even pharmaceutical companies warn that the bleeding can lead to death if severe. The article provided by Kyodo News was published in regional newspapers . There was no indication that the article was an advertisement or intended for PR purposes. It was presented as an ordinary news article. 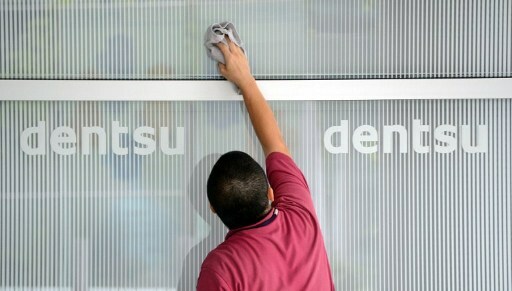 On the Dentsu side were Dentsu and its 100% subsidiary Dentsu Public Relations (Dentsu PR) . On the Kyodo side were Kyodo News and its 100% subsidiary K.K. Kyodo News . In response to our questions, a Dentsu PR employee who had been involved acknowledged the exchange of money, saying it was a payment for successful publication of the article . The Kyodo News senior staff writer who wrote the article said he was aware that the article was part of a business deal, acknowledging his awareness that money would be paid for the article . It’s not just blood thinners. 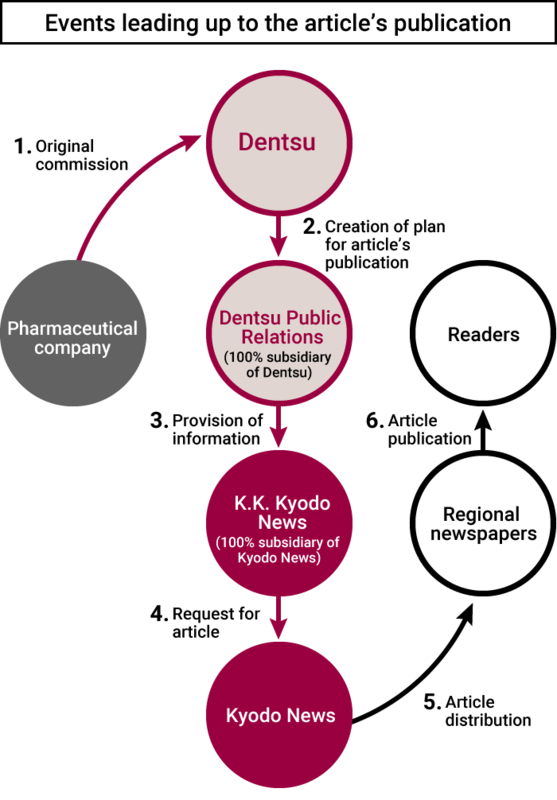 According to internal documents and testimony from people involved, money has been exchanged between Dentsu and Kyodo News for articles about pharmaceuticals since at least 2005. Internal documents acquired from Dentsu contain records of such transactions. The head of K.K. Kyodo’s medical information center admits that he felt guilt about the transactions . Money was exchanged for articles about drugs that are a matter of life or death. So were these articles bought? We decided to try to find out. What are human lives to us? What is advertising, and what does it mean to work in PR? And further, what is journalism? Through this series, we hope to address these questions together with affected patients and their families. (1) Many people are unhappy with conventional blood thinning drugs. (2) Consequently, roughly 30,000 people go off their prescriptions each year. (3) Blood thinners must be used for life. (4) Recently, a new drug has been created that only needs to be taken once a day. “Taking blood thinners is essential to prevent stroke, but many people are unhappy with their blood thinners, and every year, 33,000 people go off their prescriptions. This statistic was revealed in a study by Healthy Nippon 21 Forum (chair: Tokyo University Emeritus Professor Fumimaro Takaku). The Forum analyzed more than 870,000 health insurance claims held by the Japan Medical Data Center, focusing particular attention on cardioembolic stroke, a type of stroke that can be especially serious. Its analysis revealed that 1.3 million Japanese people suffer from atrial fibrillation and other conditions that can lead to stroke, and of those, 750,000 are prescribed blood thinners. Cardioembolic stroke is a condition in which blood clots resulting from atrial fibrillation travel to the brain and block the cerebral artery. By analyzing data from medical examinations between January and September the year before last, the yearly rate of patient termination of blood thinners was estimated to be 4.3%, meaning that nearly 33,000 patients stop taking their prescribed blood thinning medication each year. Investigation of patients who had stopped taking their medication revealed that (1) one in two of these patients was unhappy with the medication they had been prescribed, and (2) more than 80% of these patients underestimate the danger of a stroke. The Japan Stroke Association chairman Takenori Yamaguchi says, ‘Cardioembolic stroke carries great risks; in roughly 60% of cases, sufferers are left severely disabled, and three in four sufferers experience a relapse within ten years. Prevention requires patients to take blood thinners for the rest of their lives. Recently, a drug that only needs to be taken once a day has come onto the market, increasing patients’ options.’” That is as far as the article went. It didn’t name this new drug. Atrial fibrillation is a condition in which a part of the heart beats irregularly and the heart cannot push out blood effectively. Clots of blood that develop inside the heart, as a result, can travel to the brain, blocking the cerebral artery and leading to stroke. The only blood thinner produced by Bayer Yakuhin is Xarelto, which went on sale in 2012, the year before the article was published. First, let’s take a look at the study period: January to September of last year (2011). When the study was started, there was only one blood thinner on the market—Warfarin, a front-runner that has been on the market for 50 years. Warfarin is, therefore, the only drug the article could have been referring to when it stated that many people are unhappy with their medication and 4.3% (corresponding to 33,000 patients) stop taking it every year. So, what new drug was Japan Stroke Association chairman Yamaguchi referring to when he said that “Recently, a drug that only needs to be taken once a day has come onto the market, increasing patients’ options”? According to the use directions for Eliquis, it must be taken twice a day, in the morning and evening. The same is true of Prazaxa. However, Xarelto only needs to be taken once a day. 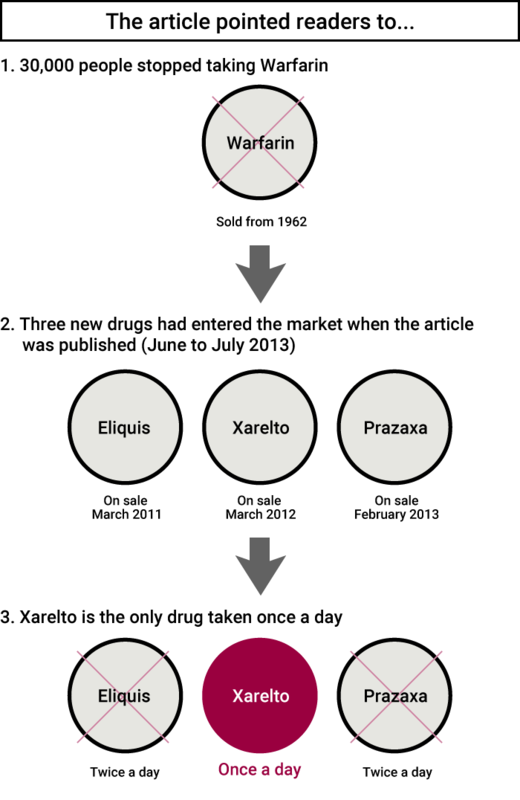 We can see, then, that the “new drug” to which Chairman Yamaguchi, age 80, refers can only be Xarelto. Any physician or pharmacist handling pharmaceutical prescriptions would know this immediately. The article therefore cleverly directed readers toward a specific drug without mentioning the drug’s name or manufacturer. So how did the articles come to be published? One hint comes from the payee indicated in the Dentsu internal documents cited above: “K.K. Kyodo.” Note that it is “K.K.” Kyodo’s business arm. Kyodo News is a nonprofit cooperative organization. It is a news agency that provides articles to its members, many of which are regional newspapers nationwide. Meanwhile, K.K. Kyodo is a joint-stock corporation that engages in business activities. Kyodo News executives also serve as directors at K.K. Kyodo . With regard to the articles in question, Kyodo News provided the articles to regional papers, and K.K. Kyodo received payment from Dentsu Group. However, journalist Toshio Hara , age 91, expressed anger at hearing this. Hara previously served as the editor in chief at Kyodo News and president of K.K. Kyodo. “K.K. is a subsidiary of Kyodo [News]. It’s a parent-subsidiary relationship. Clearly, they have the same interests,” said Hara. “It means [the articles] are being bought. Selling human lives out of desperation to make money—that’s not journalism,” Hara said. So how was the article written, and how did it end up in newspapers? To find out, we met with the senior staff writer who wrote it. At 4 p.m. on January 15, 2017, at a cafe in the suburbs of Tokyo, we met the Kyodo News senior staff writer who wrote the article. Age 65, he has long written broadly on nuclear power, medicine, biotech and other science-related topics. “Can you tell us about this article that you wrote?” we asked him. On the table in front of us, we placed a sheet of monitor paper which recorded a distribution of the article to member newspapers. The article had 53 lines, 11 characters per line. The date and time of delivery to the regional papers were indicated as being May 29, 2013, 12:22:32. The senior staff writer’s name was written in the “Author” box. We told him that after the article was published, Dentsu PR paid ¥550,000 to K.K. Kyodo as a “media expense,”and showed him Dentsu’s internal document indicating such fact. Then we asked if he had known the article was part of a business deal over which money exchanged hands. “Were you aware that this article was part of a business deal?” we asked. We pressed him again. “I wasn’t totally unaware if that’s what you’re asking,” he replied. –The head of K.K. Kyodo’s medical information center brought him a press release from the Healthy Nippon 21 Forum about the state of patient administration of blood thinners. Several new blood thinners had just appeared on the market in quick succession for the first time in 50 years, and “competition was fierce,” according to the senior staff writer. –The article was written directly on the basis of the Forum’s press release. Although the article also quoted the Japan Stroke Association’s Chairman Yamaguchi, he was not interviewed directly—his comment also came from the press release. –The article was written because he decided it was news that should be conveyed to the public. We asked him if he knew that writing the article would mean money would be paid to K.K. –Well, it was probably unlikely that that wouldn’t be the case, I guess. The senior staff writer said he used a press release prepared by the Healthy Nippon 21 Forum as a basis for his article. The quote from Chairman Yamaguchi was written as though he had actually been interviewed, but in reality, the “quote” was merely an imprecise summary of comments made by Mr. Yamaguchi, and came straight from the press release. However, there was one thing the senior staff writer did not know. The Healthy Nippon 21 Forum was organized and managed by Dentsu Group. This fact was not written anywhere on the event’s website or the press release. Japan has three types of regular daily newspapers: (1) National newspapers sold nationwide, (2) Block newspapers sold across several prefectures, and (3) Prefectural newspapers sold only in a single prefecture. There are roughly 40 regional newspapers belonging to The Japan Newspaper Publishers & Editors Association. According to a November 2016 survey by the Japan Audit Bureau of Circulations, regional newspapers make up roughly 40% of all ordinary daily newspapers sold, selling around 14 million copies daily. Regional newspapers have a very high market share in the areas where they are sold; for instance, the Kochi Shimbun has a market share of 86.9%, and the Tokushima Shimbun has a market share of 86.3%. This means that articles published in regional newspapers have a significant influence on the public. According to Dentsu Group’s consolidated financial statement for 2015, it is fifth in the world in terms of earnings. 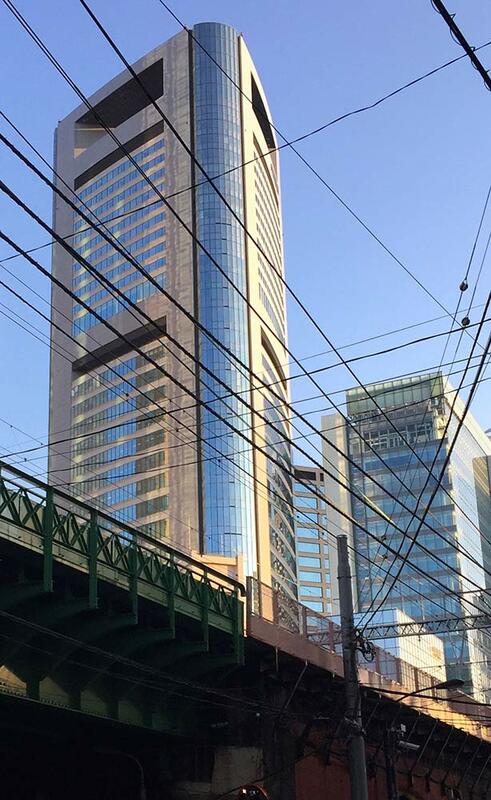 Sales for Dentsu alone put it far ahead of its closest competitor in Japan, Hakuhodo. Source: Dentsu’s website http://www.dentsu.co.jp/, “Dentsu 100 Year History: 1901-2001” (2001) etc. Dentsu PR was founded in 1961 as Dentsu PR Center. In 1968, it became a 100% subsidiary of Dentsu as determined at a general shareholders meeting. In 1996 the company’s name changed to Dentsu Public Relations. Source: Dentsu PR’s website http://www.dentsu-pr.co.jp etc. Japan’s leading news agency, founded in 1945. 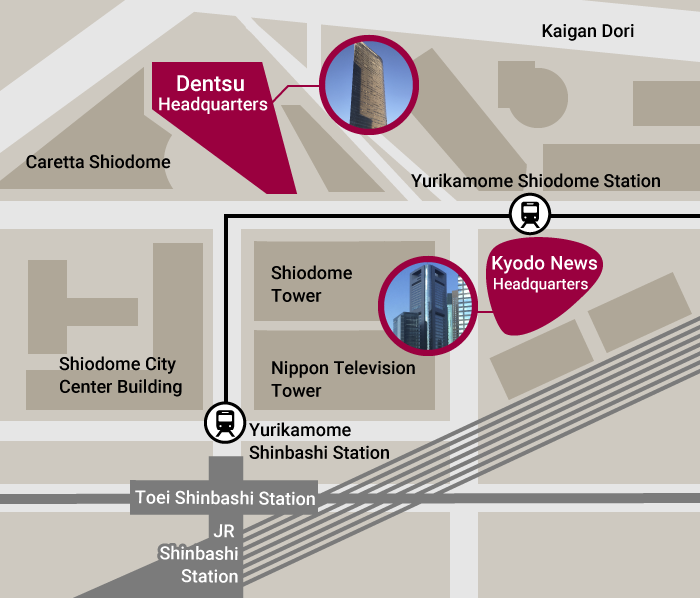 Kyodo News has branches in Sapporo, Sendai, Tokyo, Nagoya, Osaka and Fukuoka, and has bureaus in 46 cities in almost all of Japan’s prefectures. It also has bureaus in 42 cities overseas. Kyodo News is a non-profit cooperative organization that operates on the basis of member fees from the media outlets to which it provides news articles. It was founded in 1945 with newspapers nationwide and the national broadcaster, NHK, as its members; in 1952, the Asahi Shimbun, Mainichi Shimbun and Yomiuri Shimbun withdrew their membership, and Kyodo News came to rely on nationwide regional newspapers. In 2010, Mainichi Shimbun re-joined as a member. Kyodo News is a major shareholder in Dentsu. Source: Dentsu’s shareholder reports, Kyodo News’ website http://www.kyodonews.jp/english/about/whatskyodo.html http://www.kyodonews.jp/company/history.html, http://www.kyodonews.jp/news/2016/post-11.php etc. Response from Kyodo News on January 19, 2017. 100% subsidiary of Kyodo News. Founded in 1972. Interview starting at 1:20 p.m. on January 6, 2017 in Bunkyo Ward, Tokyo. The definition for this term differs by newspaper, but it generally refers to reporters having specialized knowledge in a certain field. Interview starting at 5 p.m. on January 15, 2017 in Shinjuku Ward, Tokyo. Interview starting at 4:10 p.m. on December 29, 2016 in Setagaya Ward, Tokyo. The Waseda Chronicle sent a questionnaire to the eight regional newspapers that published the article and asked each newspaper about the facts of the situation. We will report on the responses we received in detail in future installments of this series. Bayer Founded Friedrich Bayer in 1863, the company started out as a dye company. In 1973, Bayer, Takeda and Yoshitomi merged to become Bayer Yakuhin K.K. Source: Bayer’s website http://byl.bayer.co.jp/corporate_profile/ etc. Response received on January 19, 2017. Response received on January 16, 2017. 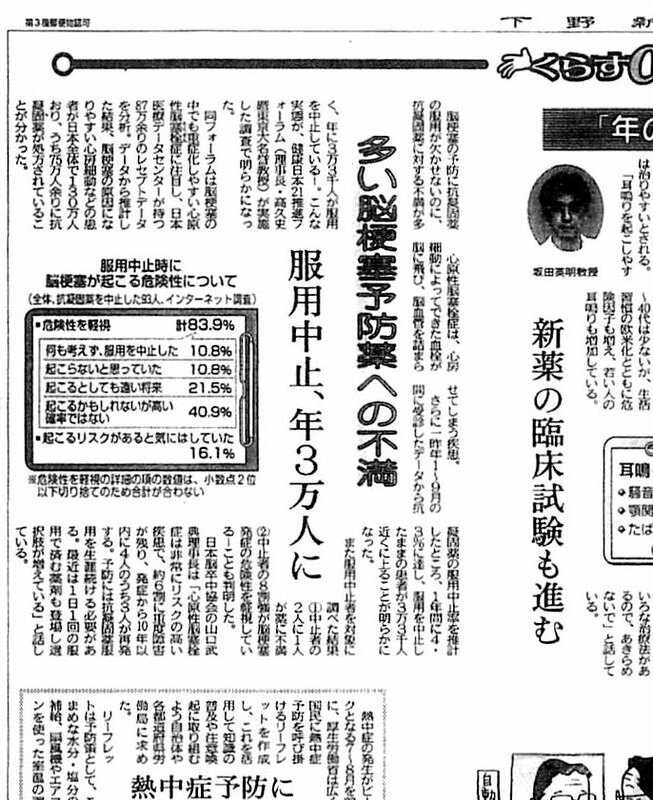 Text in brackets inserted by the Waseda Chronicle. Source: Kyodo News’ website http://www.kyodonews.jp/news/2016/post-11.php, the Asahi Shimbun morning edition of May 23, 2014 “Kyodo News Personnel” etc. Born in Kanagawa Prefecture in 1925, Toshio Hara was employed by Kyodo News after graduating from the University of Tokyo Faculty of Law. At Kyodo News, he served as head of the foreign news department, editor in chief and managing editor. From 1986 to 1992, he was president of K.K. Kyodo. Interview with Toshio Hara in Kanagawa Prefecture starting at 2:20 p.m. on November 21, 2016. Text in brackets was inserted by the Waseda Chronicle. From works written by the senior staff writer.